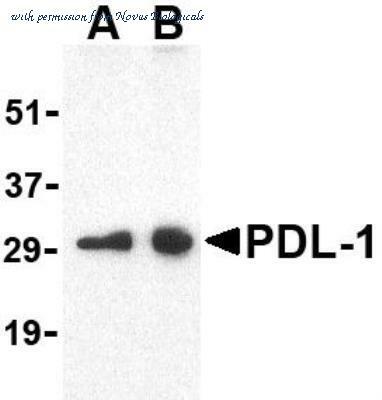 The PD-L1/CD274 antibody from Proteintech is a rabbit polyclonal antibody to a recombinant protein of human PD-L1/CD274. This antibody recognizes human,mouse,rat antigen. 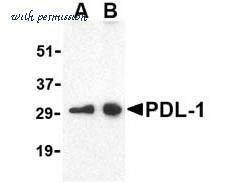 The PD-L1/CD274 antibody has been validated for the following applications: ELISA, IF, IHC, IP, WB analysis. 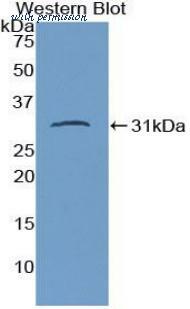 The PD-L1/CD274 antibody from Proteintech is a mouse monoclonal antibody to a recombinant protein of human PD-L1/CD274. This antibody recognizes human, mouse, pig antigen. 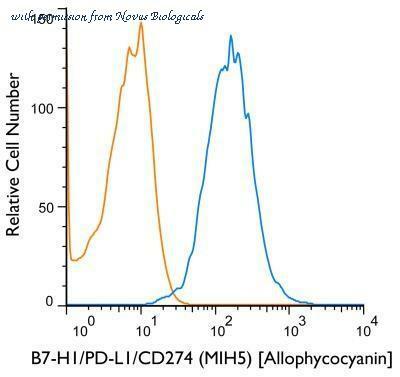 The PD-L1/CD274 antibody has been validated for the following applications: ELISA, FC, IF, IHC, WB analysis. 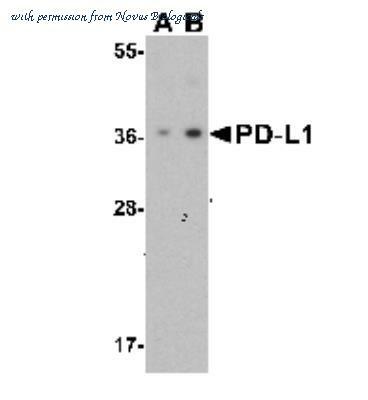 Detection of Mouse PD-L1/B7-H1 by Western Blot. Western blot shows lysates of RAW 264.7 mouse monocyte/macrophage cell line untreated (-) or treated (+) with 10 ╡g/mL LPS for 4 hours. 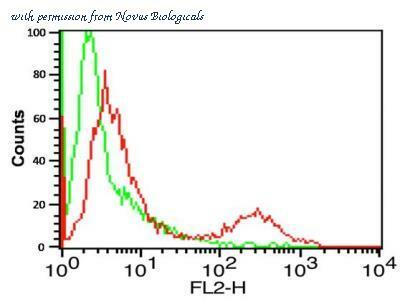 PVDF membrane was probed with 0.5 ╡g/mL of Goat Anti-Mouse PD-L1/B7-H1 Antigen Affinity-purified Polyclonal Antibody (Catalog # AF1019) followed by HRP-conjugated Anti-Goat IgG Secondary Antibody (Catalog # HAF017 ). A specific band was detected for PD-L1/B7-H1 at approximately 50-55 kDa (as indicated). This experiment was conducted under reducing conditions and using Immunoblot Buffer Group 1 . 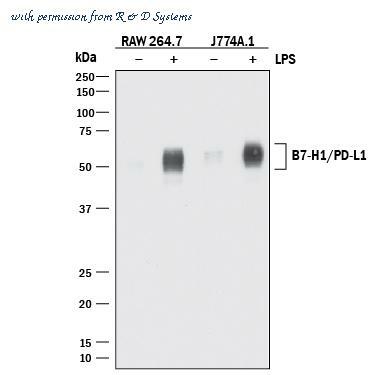 Detection of Mouse PD-L1/B7-H1 by Western Blot. Western blot shows lysates of RAW 264.7 mouse monocyte/macrophage cell line and J774A.1 mouse reticulum cell sarcoma macrophage cell line untreated (-) or treated (+) with 10 ╡g/mL LPS for 4 hours. 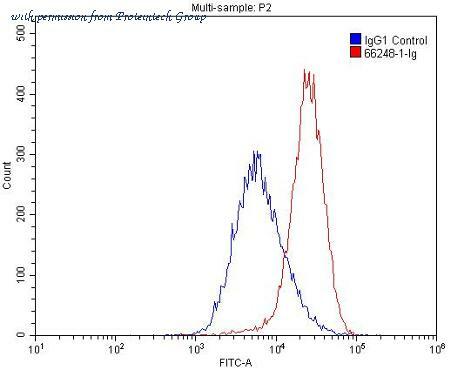 PVDF membrane was probed with 2 ╡g/mL of Rabbit Anti-Mouse PD-L1/B7-H1 Monoclonal Antibody (Catalog # MAB90781) followed by HRP-conjugated Anti-Rabbit IgG Secondary Antibody (Catalog # HAF008 ). A specific band was detected for PD-L1/B7-H1 at approximately 50-55 kDa (as indicated). This experiment was conducted under reducing conditions and using Immunoblot Buffer Group 1 . Western blot of recombinant B7-H1 / PD-L1 / CD274. This image was taken for the unconjugated form of this product. Other forms have not been tested. Western Blot: B7-H1/PD-L1/CD274 Antibody [NBP1-76769] - Raji cell lysate with CD274 antibody at (A) 0.5 and (B) 1 ug/ml. 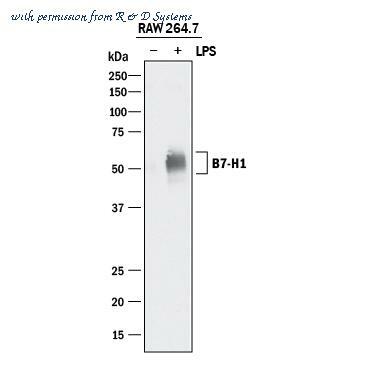 Western Blot: B7-H1/PD-L1/CD274 Antibody [NBP1-76769] - Raji cell lysate with PD-L1 antibody at (A) 0.5 and (B) 1 ug/mL. 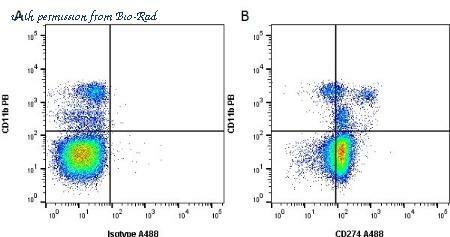 Flow Cytometry: B7-H1/PD-L1/CD274 Antibody [NBP1-76769] - Analysis of A-20 cells using B7-H1/PD-L1/CD274 antibody at 0.5 ug/ml. Green: Isotype control. Red : B7-H1/PD-L1/CD274 antibody. Flow Cytometry: PD-L1/B7-H1 Antibody (MIH5) [NBP1-43262] - B7-H1/PD-L1/CD274 Antibody (MIH5) [NBP1-43262] - Using the Allophycocyanin direct conjugate A cell surface stain was performed on RAW246.7 cells with B7-H1/PD-L1/CD274 (MIH5) antibody NBP1-43262APC (blue) and a matched isotype control NBP1-51104APC (orange). Cells were incubated in an antibody dilution of 0.5 ug/mL for 20 minutes at room temperature. Both antibodies were conjugated to Allophycocyanin. Western blot using Rockland's affinity purified anti-PDL-1 antibody shows detection of a predominant band at ~31 kDa corresponding to PDL-1 (arrowhead) in Raji whole cell lysate. The predicted MW of PDL-1 is 33 kDa. PDL-1 was detected using 0.5 ?g/ml (lane A) and 1 ?g/ml (lane B) concentrations of primary antibody. Immunofluorescence Microscopy of Goat anti-PDL1 antibody. Cell line: MDA-MB-231 p/n (W09-001-GK6). Fixation: 0.5% PFA. Antigen retrieval: not required. 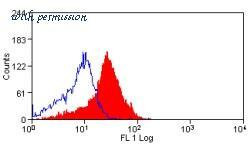 Primary antibody: PLD1 antibody at 10 µg/mL for overnight at 4°C. 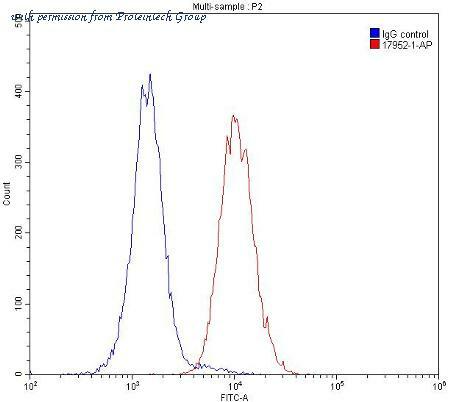 Secondary antibody: Anti-Goat IgG DyLight™488 (Rabbit) Conjugated Preadsorbed (p/n 605-441-013) at 5 ug/ml for 2 hrs at RT. Localization: PDL1 is located in the cell membrane and cytoplasm. Staining: PDL1 as green fluorescent signal with DAPI (blue) nuclear counterstain. 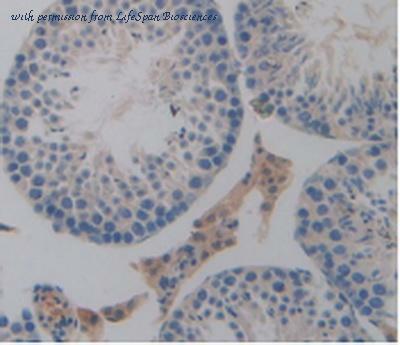 Immunohistochemical staining of mouse transplantable tumor tissue using PDL1 antibody. 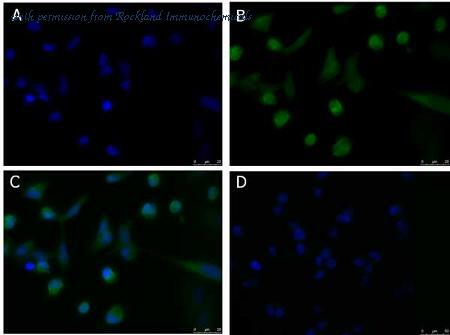 Flow cytometric analysis of Mouse spleen cell using PDL1 antibody. Immunohistochemical staining of human lung carcinoma tissue using PDL1 antibody.